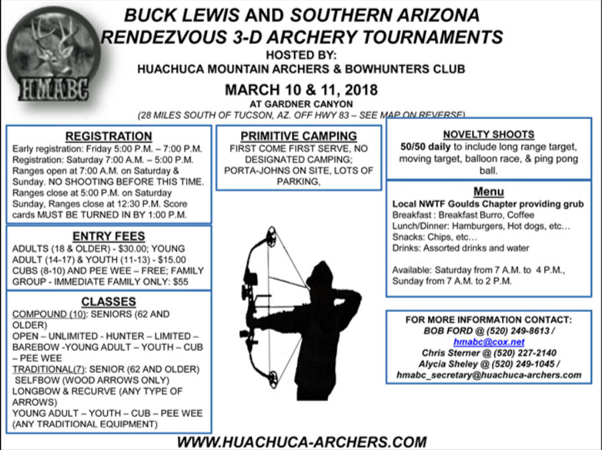 General Information: The Huachuca Mountain Archers and Bowhunters Club have supported many community events hosted by the Huachuca Gould’s Chapter with instructors and equipment. Returning the favor, the Chapter offered breakfast and lunch during the Club’s recent 2-day tournament. Monies raised by the Chapter help support its many community service and educational programs offered throughout the year. 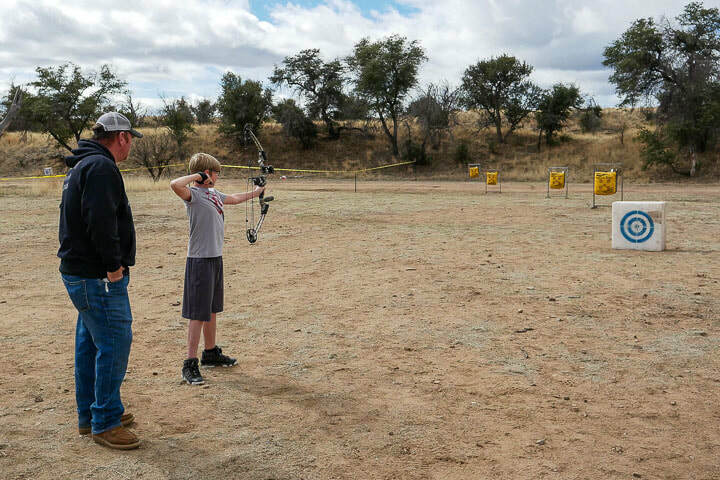 The archery shoot was held on the east flank of the Santa Rita Mountains. 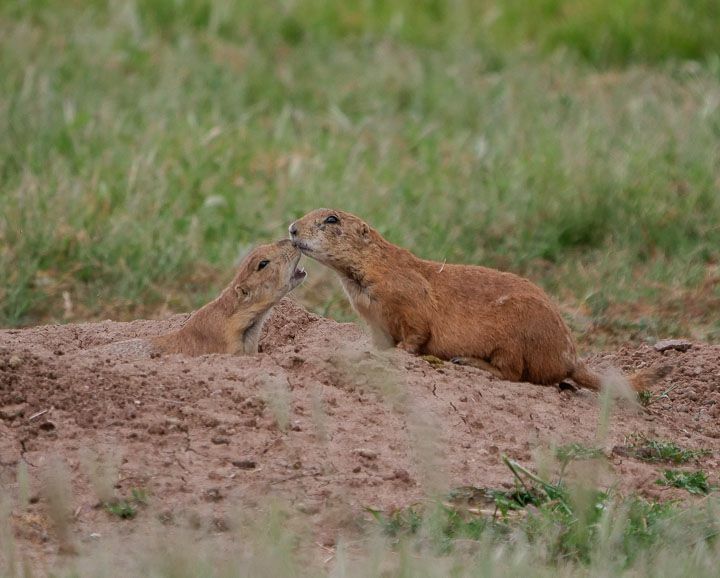 A grassland intermixed with Mexican oaks at around 5,000 feet in elevation provided the site for the range, kitchen, and camping. Temperatures in the early morning of Sunday started a little chilly with a brisk breeze, an overnight shower, and snow on the tops of the nearby mountains. The day grew milder as the temperatures warmed making for a pleasant mid-morning. Egg, sausage, and whitetail burritos with pastries and hot drinks warmed up the shooters in the morning. 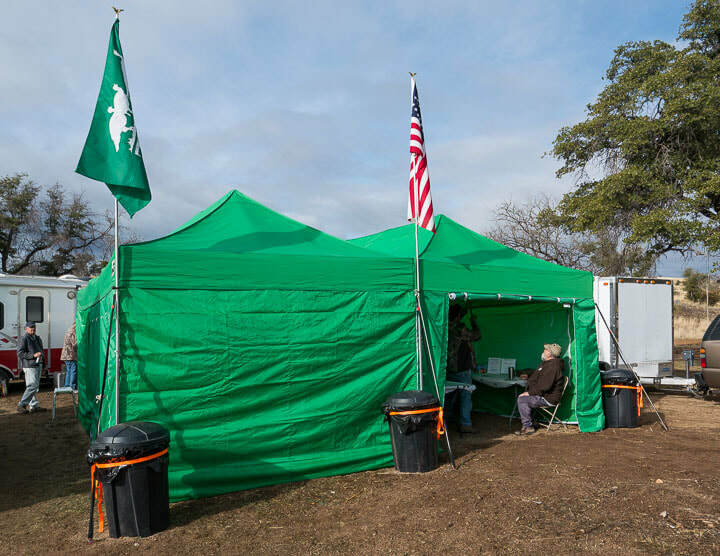 Hamburgers, hot dogs, and burritos with the fixings, chips, pastries, and refreshments were the noon-day fare. 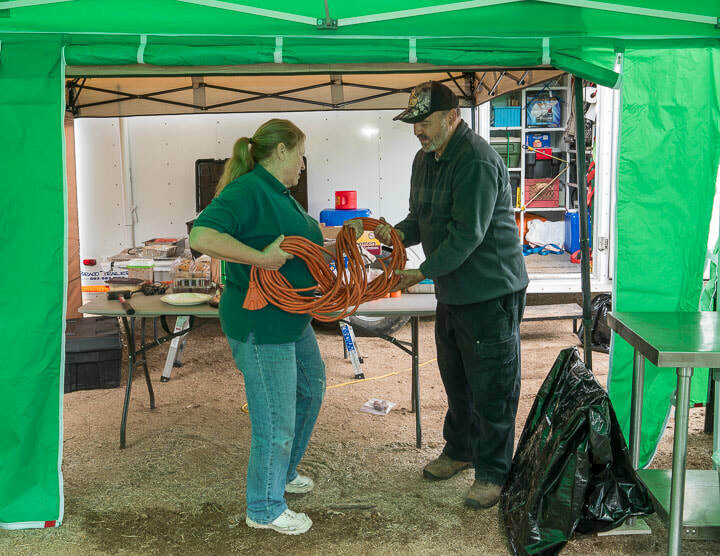 Wayne Kaiser and Tom Fuller organized supplies, equipment, and volunteers for the event. Assisting Wayne and Tom were Dave Inman, Bob Pourier, Wayne Bundza, Joey Fuller, Ward Parmanter, and Tom Deecken. 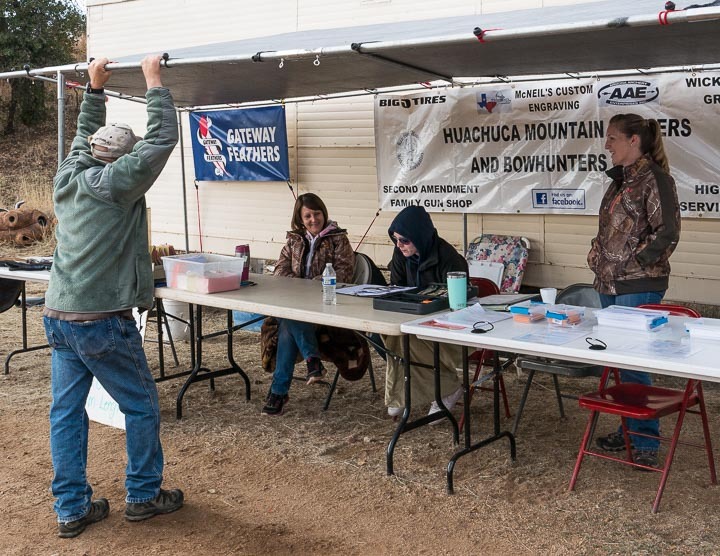 002 Tournament Registration Station- The Huachuca Mountain Archers and Bowhunters Club hosted the 2-day tournament in the Santa Rita Mountains. Holding up the canopy is Bob Ford. Toni Sterner, seated far left assists with the sign-ups. 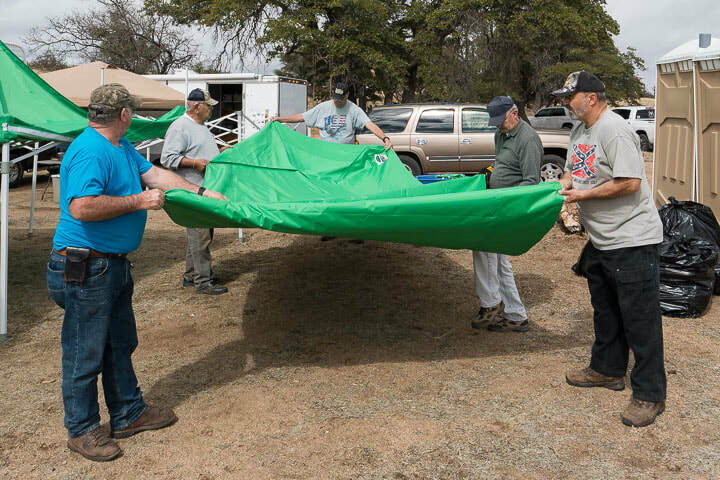 007 Teamwork?- Wayne Kaiser, Bob Pourier, Dave Kemnitz, Dave Inman, and Wayne Bundza subdue a canopy with a proper folding. 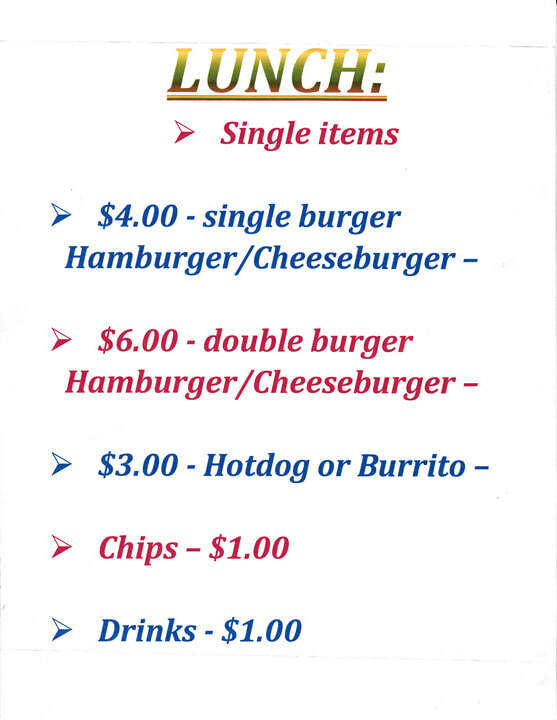 003 Huachuca Gould’s Chapter Mess Hall- Breakfast and lunch were offered on Saturday and Sunday. We call it the "GOULD'S CAFE"
005 Action on the Stationary Target Range- Joey Heiser releases an arrow down range. Joe Heiser of JT’s Archery looks on. 006 Camp Breakdown Starts- Joey Fuller and Wayne Bundza pack up the kitchen. 008 Until We Meet Again- Old friends exchange good byes and look forward to next year.